Abdel Fattah al-Sisi interview: Egypt’s top general calls for U.S. and international assistance. Gen. Abdel Fattah al-Sisi, Egypt’s top general, has stern words for the United States. 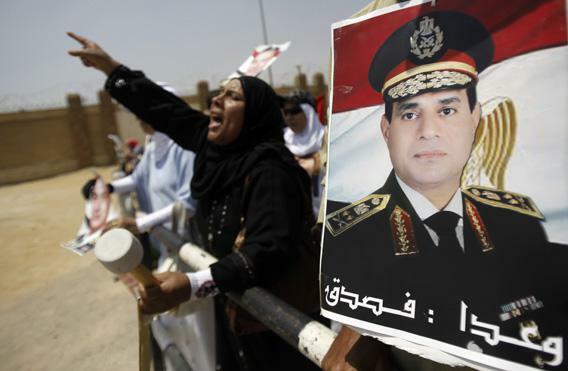 Gen. Abdel Fattah al-Sisi is in power in Egypt—but what does he want to do with it? Gen. Abdel Fattah al-Sisi: The dilemma between the former president and the people originated from [the Muslim Brotherhood’s] concept of the state, the ideology that they adopted for building a country which is based on restoring the Islamic religious empire. That’s what made [former President Mohammed Morsi] not a president for all Egyptians, but a president representing his followers and supporters. Lally Weymouth: When did that become obvious to you? Sisi: It was obvious on the first day—the day of his inauguration. He started with offending the judiciary and not giving them the appropriate treatment. The Brotherhood experience in ruling a country was very modest—if not absent. [The army] dealt with the president with all due respect for a president chosen by the Egyptians. Weymouth: So you were giving the president advice on Ethiopia and the Sinai, for example, and he was ignoring you? Sisi: We were very keen and predetermined on his success. If we wanted to oppose or not allow them to come to rule Egypt, we would have done things with the elections, as elections used to be rigged in the past. Unfortunately, the former president picked fights with almost all the state institutions. When a president is having conflict with all of these state institutions, the chance of success for such a president is very meager. On the other hand, on his part, the president was trying to call in supporters from religious groups. Sisi: They have an international presence in more than 60 countries in the world—the Muslim Brotherhood. The idea that gathers them together is not nationalism, it’s not patriotism, it is not a sense of a country—it is only an ideology that is totally related to the concept of the organization. Weymouth: The U.S. is very concerned about the sit-ins at Rabaa and Nahdet [two squares in Cairo where the Muslim Brotherhood has staged sit-ins]. Sisi: We really wonder: Where is the role of the United States and the European Union and all of the other international forces that are interested in the security, safety, and well-being of Egypt? Are the values of freedom and democracy exclusively exercised in your countries but other countries do not have the right to exercise the same values and enjoy the same environment? Have you seen the scores of millions of Egyptians calling for change in Tahrir? What is your response to that? You left the Egyptians, you turned your back on the Egyptians, and they won’t forget that. Now you want to continue turning your backs on Egyptians? The U.S. interest and the popular will of the Egyptians don’t have to conflict. We always asked the U.S. officials to provide advice to the former president to overcome his problems. Weymouth: What did the U.S. do? Sisi: The result is very obvious. Where is the economic support to Egypt from the U.S.? Even throughout the year when the former president was in office—where was the U.S. support to help the country restore its economy and overcome its dire needs? Weymouth: Are you going to run for president? Sisi: I want to say that the most important achievement in my life is to overcome this circumstance, [to ensure] that we live peacefully, to go on with our road map and to be able to conduct the coming elections without shedding one drop of Egyptian blood. Weymouth: But are you going to run? Sisi: You just can’t believe that there are people who don’t aspire for authority. Sisi: Yes. It’s the hopes of the people that is ours. And when the people love you—this is the most important thing for me. The pains and suffering of the people are too many. A lot of people don’t know about the suffering. I am the most aware of the size of the problems in Egypt. That is why I am asking: Where is your support? Weymouth: Did you feel there would be civil strife if the army didn’t intervene? Sisi: I expected if we didn’t intervene, it would have turned into a civil war. Four months before he left, I told Morsi the same thing. What I want you to know and I want the American reader also to know is that this is a free people who rebelled against an unjust political rule, and this free people needs your support. Weymouth: Aren’t the Americans warning the interim government against any further civil strife or bloodshed? Sisi: The U.S. administration has a lot leverage and influence with the Muslim Brotherhood and I’d really like the U.S. administration to use this leverage with them to resolve the conflict. Whoever will clean these squares or resolve these sit-ins will not be the military. There is a civil police and they are assigned to these duties. On the 26th of [July], more than 30 million people went out onto the streets to give me support. These people are waiting for me to do something. Weymouth: How can you assure the U.S. that you don’t want the military to rule Egypt—that the army wants to go back to its barracks? Sisi: Mark my words and take me very seriously: The Egyptian military is different from other militaries around the world. Weymouth: Do you really want to have civilian rule here? Weymouth: In a future election, would Egypt accept international observers? Sisi: We are ready to receive monitors and international observers for the elections from everywhere in the world. The Egyptians are looking up to you, the Americans. Don’t disappoint their hopes. Don’t give them your backs. Weymouth: Were you upset by the hold up of the [F-16s]? Sisi: Yes. This is not the way to deal with a patriotic military. Weymouth: Did President Obama call you after July 3? Weymouth: Did anybody call you? Secretary of State Kerry? Defense Secretary Hagel? Sisi: Hagel. Almost every day.